Massive, thick, creamy dirty white head. Body is tan brown and a little murky. Meaty, powerful nose of heavy malts and cooked sugars - very Belgian. Palate had similar traits albeit in a much more dilutive style (although to be fair the BB was Jan 2007). Good palate structure with nice fizz levels and a drying finish. Safe and honest enough effort. Clear golden amber in the glass with a small but quite thick white head. Varietal nose of sweet spices, vanilla and cloves; ok presence. Thins out a fraction in the flavour department but holds enough sweet spice and clove to keep me interested. Quite a dry style and finishes crisp. Not massively exciting but you could (and can) do worse in the Australian market place given these beers are positioned, pricewise, b/w mainstream crap at $14 a 6-pack and the premium micros at $20 (ie these dudes sell for $17 - $18). I think some marketing dude senses a cider revival. Maybe it’s the new sherry? Anyway, bright sparkling yellow in colour. Aromas have good presenece; grapey, sweet apple juice, and a very clear ginger, or maybe spicy pear? edge. If the nose promised bit of bit of complexity then the palate was a complete letdown. Thin, simple soft-drink flavours, faint sweet apple, a tiny musty note, and of course to much fizz. Not really up to snuff - they should just stick with importing the Aspland. 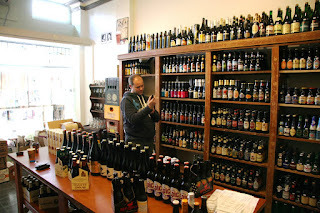 Click through to the Slow Beer store to get the full run-down on what Slow Beer is all about. Full delivery and payment details contained within. Cloudy dull orange; fizzy head with good retention. Spicy, almost peppery nose, citrus tang, good complexity. Very similar to taste; great pepper character, and the palate is quite elegant and fizzy. Very pretty and seductive beer. Dark caramel with a very thin, creamy mocha coloured head. Unremarkable. Nose is special; raisened fruity cake aromas with a strong underlay of sweet toffee and estery fruitiness. Palate is well build, medium strength fizz, more fruit cake with a liquored streak and a bitter / dark chocolate edge. Intensity does trail off a touch through the palate. Chocolate brown with a very thin coffee coloured head. Lively nose; dirty winey notes, fruity apple, faint musty wood, all backed up with a salty underlay. Mega complex (as per usual for the house). Flavours show good intensity with minerals, apples, acid aplenty, and lots of fizz. Although, and perhaps at odds with the acid observation, the palate is very broad. Finishes with more salty notes. (late 2006 bottling). Very solid beer. True to form IPA appearance with glowing dark amber, maybe toffee orange. Plenty of obvious hop character to smell along with some heavy, slightly cooked malts, the latter certaintly not in the ’sweet’ spectrum. More quality hop action to taste and the malts again show presence. Quite easy to pick the style on both nose and palate. I wish Australia had widely distributed beer of this quality. About 56 case were made available for Victoria and we managed to pick up a handful. Fully priced at just under $5.00 per bottle. Pours nicely; darkish chocolate brown with a thin off-white head. Roasty notes on the nose, dry and quite mild. Very dry and tight palate, not a huge surprise given the nose. Some hop influence here, certaintly more detectable than any roast or chocolate from the hops. I actually don’t mind this character but it takes some getting used to. Hops drive a fairly long finish. I was going to kick off this note with another rant questioning why so-called micros in this country churn out utter crap. Macro appearance of dark golden amber and a thin fizzy head. Aromas give me absolutely nothing. Flavours are terribly bland; almost CUB like with a cardboard staleness to the malts and a piss-weak level of bitterness to finish. Very disappointing. Another beer probably not front of mind when it comes to beer cellaring. I tried this bottling about 18 months ago and I thought it was ok for the sweet / dumb style. Age hasn't hurt the beer, but I'm note sure it's much better (or different). Still truckloads of cherry cola aromas, the 'weight' is such that you'd be hard pressed to pick this as beer. Same again in the mouth; I can't get my head around the soda / candy flavours. I thought this was beer? Still, it's never pretended to be anything else in terms of style. Craig Jessup, the Australian importer of Unibroue, provided some excellent tips of how to determine the bottling dates of the various Unibroue beers. Many of these beers are very suitable for at least mid-term cellaring so I hope it proves useful.